Natalia LOVES the Halloween soap dispensers we got last year; this year I'll simply refill them (a cute ghost and a pumpkin). Today we picked up some cute votive candle holders that won't weigh much at all in our suitcases, but will work well with IKEA tea lights back in Moscow. I also picked up some fun holiday-themed scented pocket hand sanitizers for the girls and the two Russian-American girls I've been tutoring for five years... Such little, little things—but they mean a lot when you can have them in a place where they don't exist! I'm also almost done getting thirty birthday gifts for the girls' classmates... It's customary at their school to do something (small) for each kid on his or her birthday—but "small" is still rather expensive at Moscow prices, and I hate to have to rush around finding something there when I'm working full-time... So far I've found really neat stuff on clearance at various places: sets of Jelly Belly lip glosses; mini packets of cotton candy that turn to gum; VERY cool Japanese eraser sets; and cute necklaces ($1.50 at Forever 21!). I'll get a few more little things and then mix and match for little gift bags... I'm going to get some neat flashlights I saw at Eastern Mountain Sports for the boys and some other girls—all different mini animals whose mouths open up to reveal the lights. Here are two of the necklaces I found today! It's funny how fashionable matrioshkas now are! 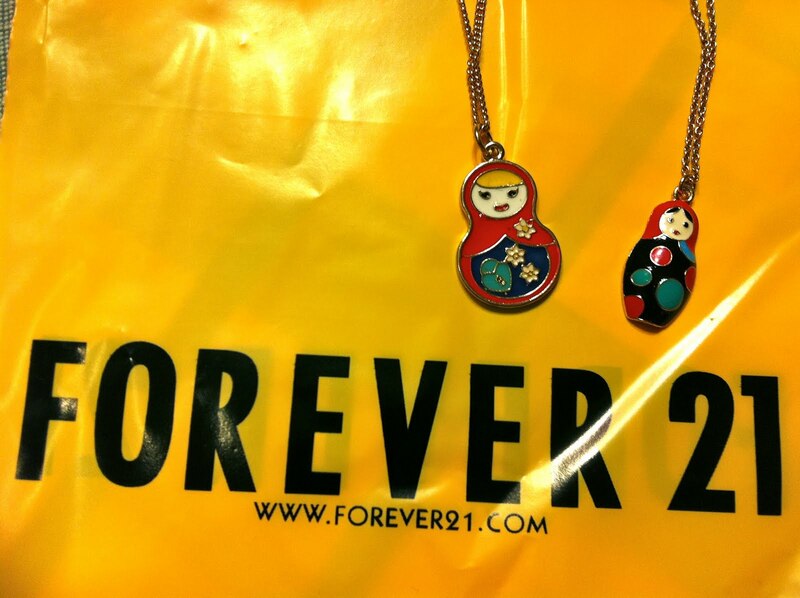 I chose non-Russian themed necklaces to give as gifts to the girls' friends, though. Mine, however, will be thrilled to get these at Christmas. Oh—speaking of Christmas, as of this morning, Santa is already set to stuff the girls' stockings... I must say, getting everything out of the way over the summer makes it nicer as the holidays approach (if only we didn't have school up until—or even on—the 25th!). I'm sure I'm forgetting other stuff, too... But I *WILL* remember when not tired late night and closer to our departure date! I'm SO, SO thankful that we no longer need to bring back books (well, almost no books) now that it's so easy to get e-books!!!! That is SUCH a help! In case the girls read your blog, remove all references to stocking stuffers or you'll blow it. Oh, how I remember doing this sort of provisioning. Last year when R broke his arm and we flew to the airport with virtually no time to pack, I left almost everything here. It would have been a disaster if I still lived in Moscow or Bratislava. They don't read my blog; I'm way too boring for them...! Don't forget to use your teacher's discount at Michael's. Oh my,you really have working vacations stateside. But from what you write about Russia, I can see how necessary it is to bring a little of the necessities back, from a cost standpoint. When we first moved to Missouri in the 70's from California, I use to take an extra small suitcase to bring back the ingredients for Mexican food. Especially tortilla's both corn and flour. At least when we move back this year, it is all available in stores. I saw some cute little matryoshka measuring spoons at my local target a week or so ago in the college back to school stuff. They were made by Fred and Friends (found at World Wide Fred under the kitchen stuff) Thought about you and your blog when I saw them. After reading this post thought it might be worth the mention to you. I don't know how you do it; to plan for a whole year's worth of needs while here while keeping within limitations you have. Amazing! You're heading this way next summer? We've made the trip between here and Russia several times and it's a long one! Hope you have a great time while you're here. If you have questions about Oahu when you're planning your trip feel free to send me an email. Thanks for your blog. I enjoy reading about my kids' birth country (our son was born in Moscow region, our daughter in St. Petersburg) from an American perspective. I sure hope your blog is still around when we take them back to visit so I can utilize some of the great links in your sidebar to plan our trip. I saw the American Girl Doll with the paddle board stuff when I was at the Mall of America! Paddle Boarding rocks. I still think you should order a blow-up paddle board and show the people of Moscow how fun it is. Love the matryoshka necklaces!! I bet security gets a kick out of screaming your bags through customs.